Understanding and knowing how to work with fragrance oil is essential in this industry. The type of oil we sell is Pure, Uncut Cosmetic Grade Fragrance Oil, and it is specifically is used in personal care products, and should only be used on the exterior of the body. Here are some frequently asked questions, as well as important facts and tips on how to work with fragrance oil. First, let’s go over the symbols used in our fragrance description and what they mean. When adding a scented product to your cart you must choose from a drop-down list of fragrances. Next to the fragrance name you may see one or more of the following symbols, an S, V or a star *. An (S) indicates that the fragrance is surplus, meaning we purchased the last of the lot. It may have been leftover from a special run for a well-known company, or just extra inventory that the fragrance house is discontinuing, but regardless, the important thing to know is that when it is gone – it’s GONE. It will not be available again. If you are seeking a signature scent for your product line, it’s best to avoid surplus fragrances and go with a stock fragrance, that, barring any unforeseen circumstances, we will always carry. When you see a (V) next to a fragrance name, this means that this fragrance has a high vanillin content, aka, it contains vanilla. Fragrances that contain vanilla tend to cause a white product to discolor or brown over time, which means you may want to add vanilla stabilizer along with the fragrance when scenting your product. The vanilla stabilizer will not completely stop the process but will slow it down. It’s also important to note that once a product has darkened or turned tan or brown, there is nothing wrong with it. It has not “gone bad”. The color is simply the vanilla doing its thing, and while it may not be aesthetically pleasing to look at, the product is perfectly fine to use. A star (*) next to a product name indicates that the fragrance is a copy of a designer type. The coconut fragrance turned my conditioner turned pink, what happened? When you add fragrance that has vanillin content, there is a chance it will discolor. Depending on the product ingredients, it can turn tan, reddish or even brown. This often happens with lotion, conditioner, and white soap. To keep it from happening, we suggest you add vanilla stabilizer to the fragrance before mixing it into the product. Why can’t I put 5% in a face cream, but I can in a body spray? You should never add above .3% fragrance or essential oil to the face. Going above that will most likely irritate or burn sensitive face skin. These are pure, uncut cosmetic grade oils which are very potent. Even in a strong body spray, the maximum used should only be 5%. The pineapple fragrance smells strong at 1%, but the green jasmine is super light at the same percentage. Are you sure they’re added at the same percentage? Yes, all of our fragrance oils are uncut, meaning we don’t dilute them with a carrier oil. The simple answer is some fragrances are stronger smelling than others. If a fragrance is too strong for you, simply lower the percentage until you are comfortable with the potency. If it’s too light, choose another. How do I add fragrance to the Pure Fresh? We all know that oil and water do not mix. When you purchase a product it is important to read the mixing instructions which advise you as to what type of product it is. Our Pure Fresh, Hydrating Botanical Mist, Aloe Gel and several others are water-based products, which means you cannot add oils directly to the product. You must solubilize (emulsify) the oils with Polysorbate 20 prior to adding to ensure they will not separate. 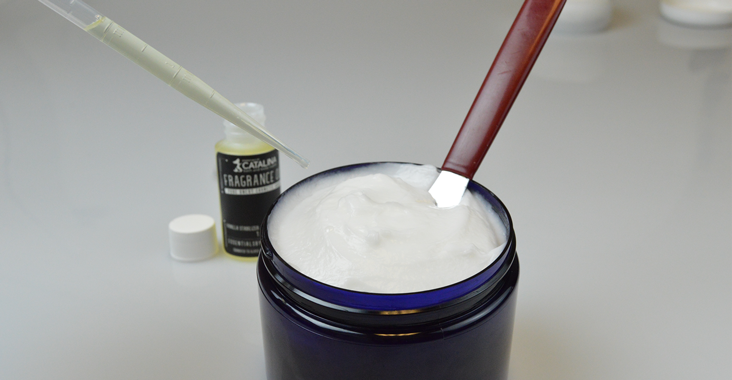 Start by adding a 1 to 1 ratio of fragrance to solubilizer in a clear container before mixing it into the base. Shake or stir well and wait to see if your oils have emulsified. You may have to go as high as 4 parts solubilizer to 1 part fragrance, as every fragrance oil is different. We always recommend testing in small batches prior to adding to an entire gallon. Can I use your fragrance in cold process soap? Some of the fragrances we carry work in cold process while others don’t. We have tested some of the fragrances, that information can be found in the description of the fragrance. However, We always recommend you test the fragrance in a small batch using your own recipe. What bases need a solubilizer for fragrance? All of these bases need a solubilizer such as Polysorbate 20. The fragrance needs to be mixed with the Poly 20 and then added to the base.